Illness, injury, and aging can leave your pet suffering with pain and disability, just like humans experience. This can be difficult for loving pet parents to watch. Rehabilitation Therapy, a quickly-growing field in veterinary medicine, provides many solutions to help your pet have less pain, function more easily, and recover more quickly. Even patients with less severe conditions can live more comfortable lives following therapy. Our Mesa and North Valley locations are now equipped and staffed to provide many therapeutic services to help your pet feel better sooner. Similar to Physical Therapy for humans, Rehabilitation Therapy is an individualized course of treatments to help your pet have improved pain reduction, healing, and function when sick, injured, recovering, or aging. Sometimes these services are also referred to as Canine Rehabilitation, Veterinary Rehabilitation, Canine Physical Therapy, or Physical Therapy for Pets. Which treatment types are available? Low-intensity laser light application to reduce pain and inflammation and stimulate healing. To learn more click here. Can my pet benefit from Rehabilitation Therapy? Most pets experiencing pain or difficulty moving as the result of sickness, injury, illness, or aging can benefit from Rehabilitation Therapy. No matter the cause of the problem, our goal is to help your pet return to whatever it is s/he loves doing – walking, running, playing fetch, or snuggling up to human friends – as soon as possible. Prior to beginning treatment, your pet will be examined to determine if s/he is a good candidate for therapy. When surgery is required to treat your pet’s condition, the road to recovery can be long and difficult. Rehabilitation Therapy can reduce the amount of pain and recovery time following surgery. Your pet’s treatment plan will help cuts and bruises heal more quickly, reduce pain and inflammation, improve muscle retention and rebuilding for immobilized limbs, and prevent further injury for animals that might try to return to full activity too soon. For diseases that have no cure or get progressively worse with time, it can become increasing difficult for your pet to move around and enjoy life. Rehabilitation Therapy can help your pet enjoy life with fewer limitations. Our therapeutic treatments can reduce the amount pain, tension, inflammation, and muscle spasms that your pet experiences. Treatment can also improve your pet’s strength, balance, flexibility and range of motion, allowing you and your pet to share more enjoyment every day. Injury to your pet’s bones and joints can cause significant pain and restrict his/her ability to move around freely. When these injuries are not provided the right conditions to heal properly it can result in significantly increased recovery time or permanent damage. Rehabilitation Therapy can help maximize your pet’s recovery speed and reduce the pain that your pet experiences, helping him/her return to full activity sooner. When muscles, or the tendons that connect them to the bones, are damaged or have limited movement they begin to break down quickly. These weakened muscles can limit your pet’s ability to return to full activity after an injury. Rehabilitation Therapy can slow down or reverse muscle loss, restore range of motion, and decrease the pain and inflammation that your pet experiences, helping your pet have fewer obstacles on the way to recovery. Disorders of the brain or other parts of the nervous system can result in pain, muscle weakness, and immobility for your pet. Rehabilitation Therapy can slow the progression of these diseases and help your pet maintain the most function possible. If your pet is suffering as the result of a neurological disorder, proper treatment can result in reduced pain, improved strength and balance, and increased mobility. When your pet is in pain it can make every part of daily living much more difficult. Whether the pain is the result of a surgical procedure, illness, injury or aging, Rehabilitation Therapy can help reduce the pain through a combination of treatments tailored to your pet’s individual needs. As pets put on extra weight it can become increasingly difficult to be active and reverse the effects of weight gain. Heavier pets can have difficulty moving around at all, making exercise seem out of the question. Our Rehabilitation Therapy services can provide an individualized weight loss plan and dietary counseling as well as therapeutic treatments to build up strength, endurance, and mobility, so your pet can become more active and achieve a healthy weight over time. Many pets experience painful or weakened muscles, stiff joints, and a general loss of energy as they enter the later years of life. These changes can affect even the most common activities like getting back up after lying down. Rehabilitation Therapy can help minimize the effects of aging by increasing strength and flexibility and decreasing pain and inflammation, helping your pet enjoy an improved quality of life during their advanced years. We want to help your pet feel better. Our Mesa and North Valley locations are equipped to assist in your pet’s recovery. 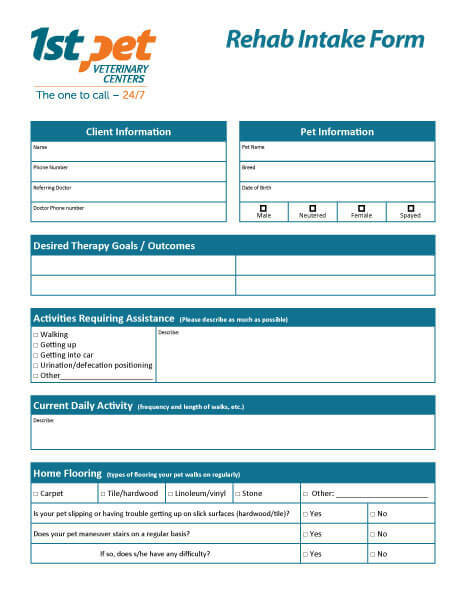 Call us today to learn more or to schedule an evaluation for your pet’s Rehabilitation Therapy needs.